Louisiana Registered Nurse Lynne Truxillo died on April 11, 2019. At Baton Rouge General Hospital on April 4th, when patient Jessie Guillory attacked one of Lynne’s coworkers, Lynne stepped in and pulled him from the other nurse. As Nurse Lynne Truxillo tried to escape his grasp, Guillory grabbed her by the neck and violently slammed her head down onto a desk before others could restrain him. In the melee, Lynne also suffered a pulled muscle but as a dedicated nurse, she finished her shift. Six days later, she returned to the hospital for care and was placed in the ICU. Sadly, Nurse Truxillo passed away at the age of 56. An autopsy showed the trauma of the previous week resulted in blood clots in her leg which led to pulmonary emboli. The death of the wife and mother of 2 was ruled a homicide and Guillory was charged with manslaughter. 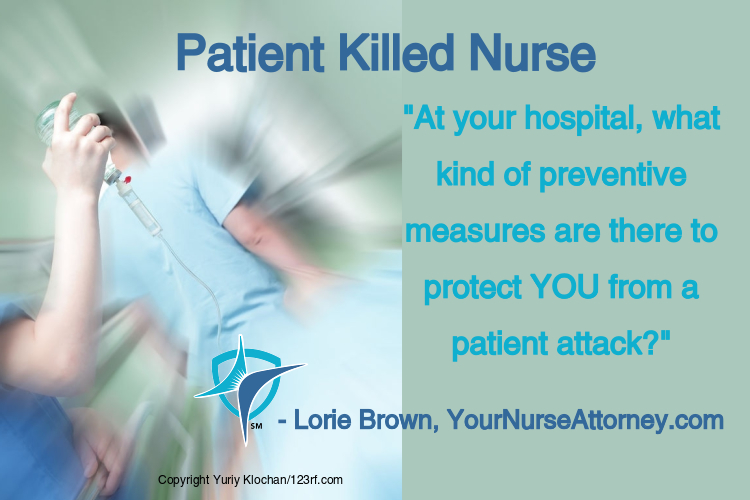 I have seen situations where nurses have to face an aggressive patient and is forced to defend themselves. Incredulously, this can result in a claim of patient abuse. So where do we draw the line? Nurses arrive at work prepared to help patients; not to be injured. What is going to be done to stop these tragedies? Numerous nurses are injured, some seriously, and even raped in the past several years. At your hospital, what kind of preventive measures are there to protect YOU from a patient attack? Is your supervisor supportive of you when you report an aggressive patient? Let me get your valued feedback and opinion below. These days cameras are everywhere. In fact, in the United Kingdom, any person can be seen on camera at least 300 times every day as the devices are everywhere. Every time you’re on the street, every time you enter a store, restaurant or bank, drive into a public garage … anywhere and everywhere the chances are likely that a camera is looking at you. And now they are making their way into hospitals around the world. A recent case in San Diego against Sharp Hospital, Administration put 3 motion detector cameras on their anesthesia medication cart because someone was stealing propofol. However, the cameras did not shut off when there was no motion and it happened to be in an OB surgical suite where women were having babies by C-section and GYN type surgeries where the patients’ genitalia were exposed. These patients, some of whom where unconscious, were being videotaped without their knowledge or consent. The hospital no longer has 3 of the servers with the videos and is unsure if the hard drives were properly erased. This is scary and a true invasion of privacy as well as a violation of HIPAA. There are also ICUs where patients consent to be monitored on video tape called E ICU. 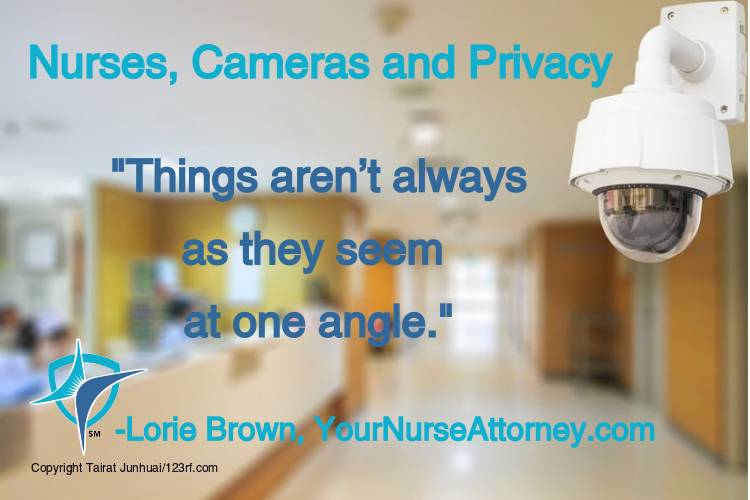 Video cameras are sometimes located in public areas of hospitals and health care facilities. I think cameras can help … and they can hurt. The idea of having cameras at the Pyxis is to see who takes medication and whether medication is properly wasted. This can be helpful to show your properly wasted medication with a witness or it can hurt if you forgot to sign out that you administered the medication. If your facility does have a camera at the Pyxis, I would recommend that you administer the ordered medication to the patient right away, document that on the MAR and then immediately waste the medication in front of the camera with a witness so there can be no question about you properly deposing of the medication. Cameras also can be a disservice because they capture images at only one angle and you cannot get the true 3-D picture. If you go to break up an altercation with patients in a hall, what the video shows will depend at which the camera views the scene. Or, if you are providing care to a patient on video, it may be misconstrued that you are being rough with a patient. Things aren’t always as they seem at one angle. Sometimes you need multiple angles. I do have concerns about patients’ privacy on video. I think sometimes facilities will give you a paper and ask you to sign it and most will do as they are told but not bother to read it. In some respects, cameras can be a blessing and help a person if the footage is kept and sometimes it can be a curse. What are your thoughts on being videotaped doing your job? When I was practicing years ago, there were no rules regarding professional boundaries. I took care of people in the community where I lived and everyone knew each other. When I would run into them at the grocery store or the mall, I would always say “hi!” Some of my colleagues even went to former patient’s houses for meals or holidays. Nowadays there are rules regarding professional boundaries. As much as we would like rebel against these rules, they really are designed to protect us. Lately, I have seen nurses who date patients after their care has ended and then the relationships go sour and the former patient files a complaint against the nurse. I’ve also seen a nurse who just wanted to help a patient in a nursing home who asked her to go to the bank machine across the street and withdraw money from her account for her. The nurse would take the patient’s card and her PIN, go across the street and bring the patient back cash. The nurse even went on her break. The nurse thought she was doing the patient a favor. However, the patient reported that the nurse stole thousands of dollars from her account. Lastly, another nurse befriended a former patient of hers and she would meet him frequently outside of work. He then made false claims against the nurse and told her if she would pay him some money, the complaint would “go away”. As you can see in each situation, the nurse violated her professional boundaries by becoming involved with a patient above and beyond what she was employed to perform, nursing care. In each case, the nurse thought she was helping a patient or in the case of relationship with a former patient she married, a life partner. But in each of these situations, they backfired against the nurse and resulted in Nursing Board claims. 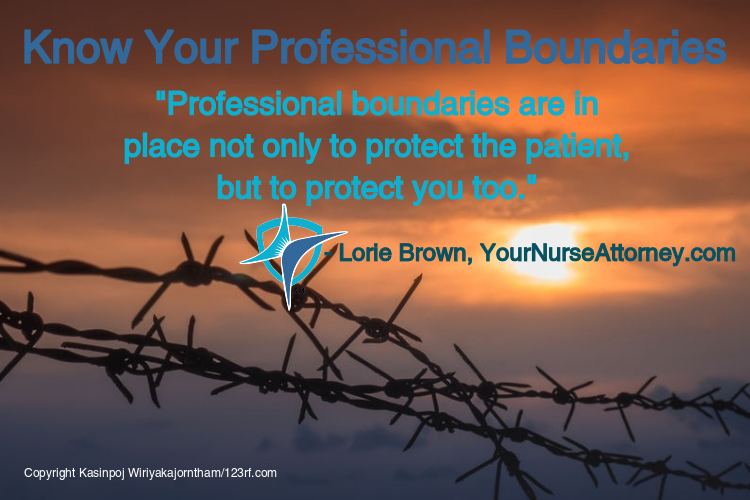 Professional boundaries are in place not only to protect the patient but to protect you too. As a nurse, it’s fine to say hello to former patient you see on the street but that is it. Do not establish a relationship or friendship with that person. Once the nurse-patient relationship ends, it is okay to befriend a patient but be careful of what happened in the above situations. Your license is more important and it’s important to do what you can to keep it safe. I would love to hear any stories of nurses’ good deeds that turned bad like the ones above and how they handled it. Please share in the comments below. 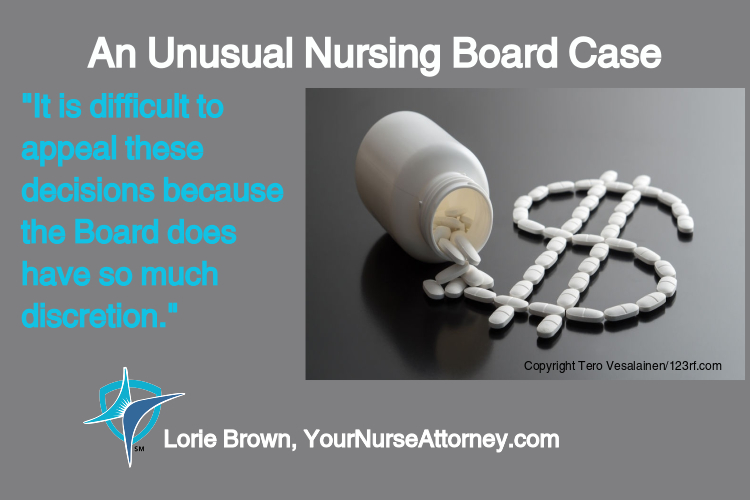 After getting an unfavorable Nursing Board decision, it is unusual for a nurse to appeal the matter to a court. It is even more unusual for such an appeal to make it all the way to the state Supreme Court. However, Appellants Christine Mulry Francis and Angela L. Caldwell DeBenedictis did just that. The facts of this case are very interesting. Nurses Francis and DeBenedictis were employed in supervisory roles in a Delaware correctional facility where a patient inmate was being administered a very pricey hepatitis C pill costing $1,000 each, and could only be provided in lots of 28. Because of the high cost of the pills, 2 on-duty nurses (neither Francis or DeBenedictis) were required to count the medications just as if it were a controlled substance. While performing a count, 1 nurse accidentally tipped over the pills, spilling 12 of them onto the floor. Both nurses believed the dozen pills, valued en toto at $12,000, should be wasted because the medication had hit the floor, and deposited the medication in the sharps container. When pharmacy was contacted to provide more of the pills, they hit the roof! After the pharmacy, a private company, contacted their superiors about the incident, instructions were delivered to supervisory nurse Francis to remove the pills from the sharps container and return them to their original container. Ms. Francis asked Ms. DeBenedictis to join her as they complied with the order and placed the pills in a paper towel before restoring them for later use. The patient inmate was never informed of this incident. When one of the nurses originally involved in the attempted wasting learned that the pills had been retrieved and given to the patient inmate, she reported the matter to the Delaware Division of Professional Regulations. The Hearing Officer concluded that both supervisory nurses violated the standard of care and placed their licenses on probation for 90 days as well as requiring them to have continuing education in the areas of pharmacology and nursing ethics. The nurses appealed to the Superior Court, which set aside the Board’s decision because no harm came to the patient inmate. Then, upon appeal to the state Supreme Court, its October 2, 2018 ruling was that the Board had been acting properly and the Supreme Court returned the matter to the Board for further recommendations. I cannot believe the time and expense that must have gone into this case. It is difficult to appeal these decisions because the Board does have so much discretion. The nurses in this case should not rely on the directions of pharmacy but need to use their own common sense. No one would want to ingest medication, which hit the floor and was tossed into a contaminated sharps container. However, as nurses, none of us wants any action on our licenses, because nursing is part of our identity. I would like to hear your thoughts, which you are invited to post below, on this interesting case. Lorie Brown, Nurse Attorney, discusses problems that are the result of a Pyxis audit and how to protect your Nursing License. This includes how it may look like a nurse is diverting medications and making sure you are administering and wasting medication properly so you protect your license.